Paper is the most critical part of the paper aircraft. Yup, it's all about the paper. This may sound so obvious that it becomes ridiculous. However, there are several properties that can vary between different types and brands of paper. Understanding these properties and how they change the airplanes aerodynamics is essential to designing and building good paper airplanes. Important paper properties include: strength, stiffness, stretch, weight, and texture. All of these properties have an effect on the actual folding of the paper, but, when it comes to flying paper planes the three most important are: stiffness, weight, and texture. You can refer to the PDF file for more detail on why these properties are so different for different brands of paper. What we are going to concentrate on here is what our best choices are for success in both building and flying paper airplanes. Over the years I have noticed that if I find a paper that make good airplanes it does not seem to stay on the market for very long. Part of this is that paper sales have been based on supplying a product that is used for so many different things. I personally think that the aerodynamic quality of the stock should take precedence. However, not everyone agrees. With the demand for heavy, bright colored printer paper over the last several years, I thought that the problem was no longer going to be an issue. The only problem is that cost of making good paper airplane stock is more expensive than just making bright colored paper. The main characteristic that suffers in today's market is stiffness (not from too little but from too much). It requires more processing time to reduce stiffness and produce a softer paper. This increases cost and in order to provide the most competitive price most stores are selling lower quality paper. My favorite airplane paper was "eXtreme colors" from Ampad and sold at Wal-Mart. Unfortunately, this paper has been replaced by "Embassy Colored Paper" from Ampad. This paper is much too stiff for paper airplane folding. For those of you who don't read the advanced text PDF file, the problem that occurs with stiff paper is that the wings won't curve due to the difference in air pressure on the top and bottom of the wing. This causes a decrease in lift and an increase in drag, thereby, shortening airplane flight time. (See the FoilSim, full version, software page and using flat plate wing add a little camber and watch the improvement.) Worse, one wing can bend while the other does not and the lift and drag become unbalanced leading to instability. I have not checked Kmart or Target yet to see if they have changed their paper types. As a note, the paper they have sold before ("Hots" from Georgia-Pacific, and "Brights" from Riverside) were better than "Embassy Colored Paper". "Hots" is fairly good and "Brights" is OK but a lighter paper. Note: The good news is that yet more changes have been made since the last update on this paper page. The current paper available as of 2014 is better then that which was available a couple of years ago. Ampad Copy Paper 24# (Walmart), Neenah Astrobrights 24# (Walmart), and Pacon Brights Laser and Inkjet Paper 20# (Fred's) all work well. The glow color variety of the Ampad Copy Paper seemed a little less stiff (better) then the primary color variety. Weight is the next important property for airplane flight. Unlike full size aircraft, we are trying to get as much weight as possible built into our paper airplane. The reason for this is to give us the most momentum to overcome drag. Most paper gliders have wings that produce more then enough lift to compensate for the heavier weight as long as we maintain a good speed. At the same time, the paper must remain foldable. This usually leaves us to compromise at a paper that is 24 lb weight. You can search out the details of why paper is labeled under the weight values you see on the package but I am going to just present a table at the bottom of this page that show the weight values and equivalent thicknesses. For folded design we are going to be using bond paper. For those gliders that do not have too thick of a bend 28 lb paper can be used for an even better weight. Things get a little more confusing when it comes to paper or poster board to make glue up style gliders. These airplanes are a lot of fun but the weight can throw in some variables. 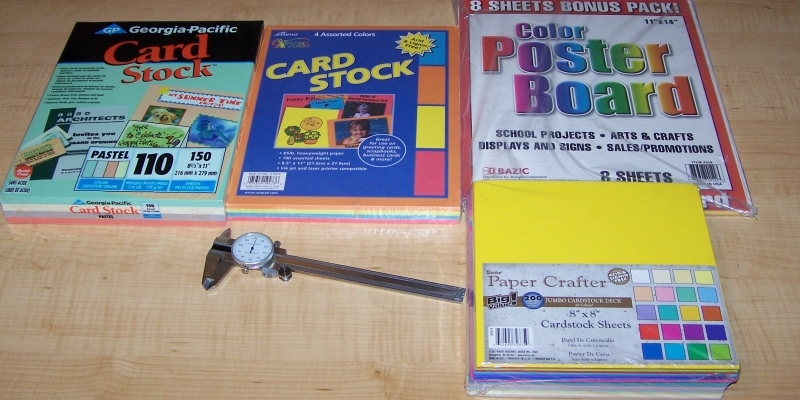 First, most poster board or heavy craft paper for scrap booking does not even give a weight (most poster board is about 140lb index stock). When weights are given you might see 65lb or 110lb card stock. These two papers are very similar in thickness and weight. The difference is that the 65lb stock is cover stock and the 110lb is index stock, both of which are sold as card stock. Both varieties along with poster board will work for glued airplanes. The lighter stock may show a little instability if not well trimmed. On many of the craft type paper it may be too thin unless you first glue two pieces together. This would make for a nice paper airplane if two colors are used together. The biggest thing to remember is that the difference between the papers is the thickness and you may have to measure it. The last major characteristic to affect aerodynamics is texture. Many of the nice looking (for us with older taste, imitation parchment is nice!) papers available have a texture that can cause a bit of extra drag. This also seems to be the case with paper that I like the feel during folding. For best flight conditions on paper airplanes the paper surface should be smooth but not have a "sticky" coating. The Embassy "Fine Paper" series including the parchment look do make pretty good airplanes. The Riverside "Parchment" paper is also OK. You can see what the packages look like in the photo below. So, at last, I have come to the point of giving my final opinion on the best paper. With the disappearance of "eXtreme colors" the best choice I have found is .... drum roll please...... 24lb Ink Jet Paper like the type shown above from Georgia-Pacific. Yes, it is plain paper, but is also plane paper!!!. For those who need color you have two choices: Use computer graphics to add some art to your favorite designs or keep looking for that perfect paper. Chart compiled by: Micro Format,Ink -- Check out their site for other good data. Copyright 1997-2005 Micro Format, Inc.